If you are a Girl Scout troop cookie leader then myCookie Leader is for you. Take the stress out of managing the details so you can focus more on supporting the Girl Scouts as they learn the business side of cookie season. 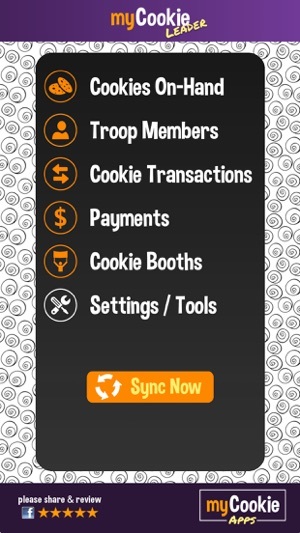 myCookie Leader enables you to view troop cookie inventory on-hand, monitor cookies going to and being returned from scouts, track both scout and council payments, and note cookie booth sales. Manage multiple troops. Created by an experienced Girl Scout cookie-selling family who volunteers as their troop cookie manager. Special care was taken to make sure the app is simple to use yet full of time saving features. 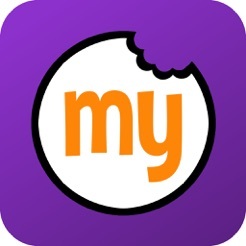 *View a list of features below and please check out our other Girl Scout cookie season apps: myCookie Family and myCookie Booth. --Choose cookies from two sample lists by baker or create your own list to match your cookies being sold. --Manage more than one troop. --Track all of the cookie inventory coming in and going out of the troop between the council, troop and individual scouts. --Quick view screens show, by cookie type, how many boxes the troop has received, where they went, and how many boxes are on-hand. -Total cookies received from and returned to the troop. -Money turned in to the troop and the remaining balance owed. 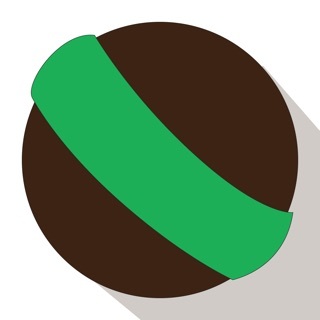 -Cookie sale credits earned from cookie booth participation. 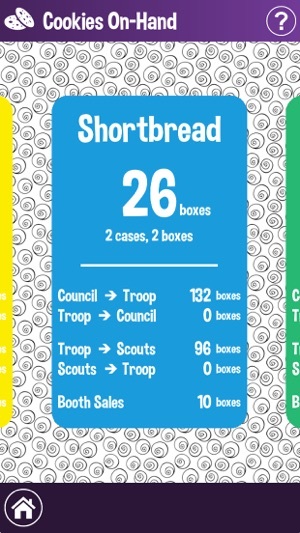 --Email a summary to individual scouts with their cookie activity, including how many boxes they have received and returned to the troop along with payments they have made and balance owed. --Track scout and council payments and amount owed. 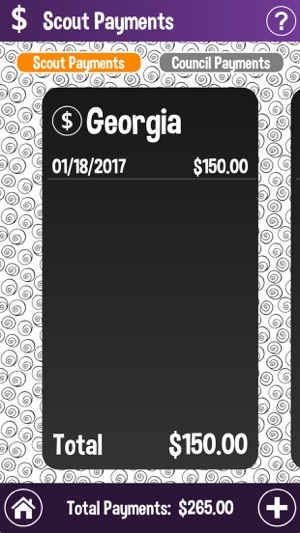 --Keep a summary of the cookies sold and donations received at each cookie booth. 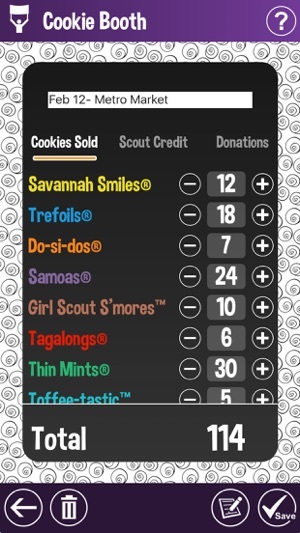 --Enter cookie sale credits earned by each scout for participating in cookie booths. 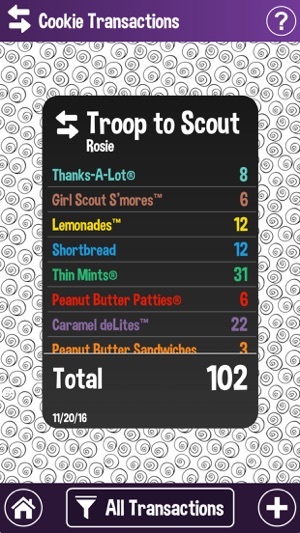 I have used this, along with the family app, to keep track of my troop’s cookies. It is so very simple to know what cookies I have on hand, I always have my phone handy and it’s always up to the minute. The email report is helpful to keep parents informed and it even lets me keep track of cookies sold at booths. I would love to see a check box to designate type of payment parents use. I would also love to see a button to designate a pulled/picked up order vs just entered. I love this app. I really do. 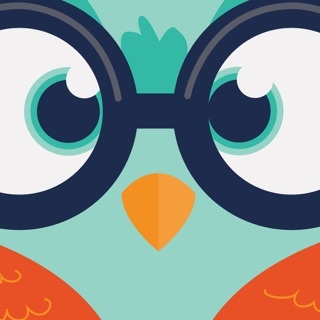 Being a scout mom and service unit product manager, these apps keep me organized. I need these totals in an excel sheet though and the only way to do that is to email me the text form and then format it and make it readable. Make it easier to export into excel. Also, my scout list apparently isn’t updating. When I send the email, it sends me the ones I had in there last year. The new ones this year, it completely skips them. Ugh...so frustrating. Saving time, maybe if I didn’t have to format the spreadsheet. This app is amazing!!! It helped me so much to run my troops cookies the way I wanted. Kept all the records for me the way I wanted them and I just transferred the info into smart cookies. I always knew how many cookies I had on hand how much money was collected for the troop, each girl, and booths. Keeps booth credits for the girls. Money owed and paid to council. It even tracked girls returns or exchanges. It’s just incredible!! I highly recommends to every cookie mom!